Those who love the Great Lakes despite their wild weather will fathom the fun of snuggling beneath them. Is what you need, if you love a Great Lake. (The person writing this grew up in Minnesota and still shivers at the memory of jumping into Lake Superior in June. So she knows.) 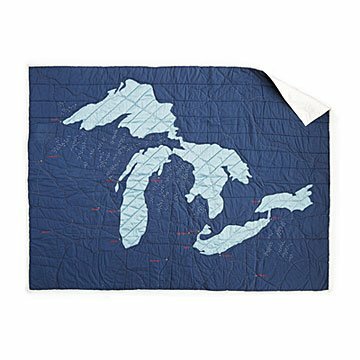 This cozy comforter covers all the emotional bases for people who love, and endure, the Great Lakes. Happy memories? They happened in locations depicted right on the quilt. Chilly, Great Lakes nights? Snuggle beneath Buffalo, Green Bay, Duluth, or Lake Gitchee-Gumee and stay warm 'til morning. The gorgeous throw is hand-quilted with superfine cotton, and the lakes are appliqued with polysilk. City names embroidered on the quilt include: Duluth, Green Bay, Twin Cities, Milwaukee, Madison, Iowa City, Chicago, Fort Wayne, Traverse City, Detroit, Ann Arbor, Toledo, Cleveland, Pittsburgh, Buffalo, and Toronto. Designed in Brooklyn. Handmade in India. Machine wash cold on a gentle cycle, then tumble dry low or lay flat to dry.